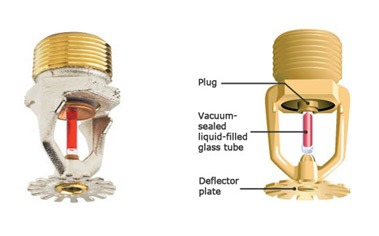 The glass bulb applies pressure to the cap which acts as a plug preventing water flowing. The bulb is filled with a glycerine based liquid which is dyed a specific colour dependant on the temperature rating and then sealed leaving one small vapour bubble. As the ceiling temperature rises, the liquid absorbs the heat until it exceeds a specific temperature, the vapour then shrinks and the liquid expands until the glass bulb breaks. Water will then flow and spread outwards as it strikes the deflector plate. The fusible link of the sprinkler assembly is comprised of two link halves that are soldered together with a thin layer of solder. When the rated temperature is reached, the solder melts and the two link halves separate allowing the sprinkler to activate and water to flow. 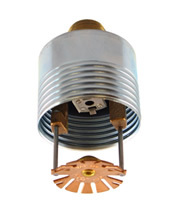 There are basically two types of fire sprinkler head, pendant or concealed, either can be wall or ceiling mounted. Pendant heads would normally be used when there is not sufficient space above the ceiling of behind the wall to fit a concealed sprinkler head. When concealed sprinkler heads are exposed to heat from a fire, the cover plate, which is normally soldered to the support cup at three points, falls away to expose the sprinkler assembly. At this point the deflector supported by the arms drops down to its operating position. The sprinkler heads is now ready to actuate if the temperature continues to rise.